Several weeks have passed since I've written anything here, and October is nearly over. While I'd like to blame the San Francisco Giants for progressing too deep in the baseball postseason, I simply have not made enough time for my language study. On the other hand, I have had several experiences this month related to my cultural understanding of Ethiopia, and I hope to document them before the month is over. The first took place on Saturday, October 4. Suzanne and I planned to spend that Saturday night in Napa, so I arranged to meet Professor Adugnaw Worku at his home in Angwin, a small town just north of Napa with a population of about 3,000, many of them Seventh-day Adventists. I had contacted Adu Worku after Lulit gave me his email, and we had met briefly at the Enqutatash festival in Oakland on September 13. 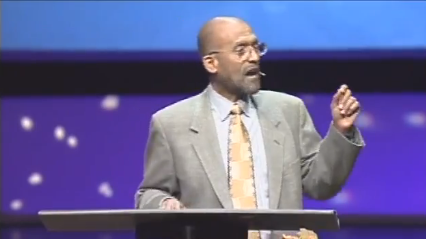 There he had told me the story of his incredible journey from Ethiopian goatherd to American professor, and so I already knew of his connection to the Seventh-day Adventist Church. His story is indeed fascinating, and it hinges on an event that occurred when Adu was fifteen years old. While walking through bushes, a friend just ahead of him bent forward a thorny branch that then snapped back into Adu's left eye, causing extensive damage. Adu had no choice but to make a 50-mile journey to a hospital, which was run by Seventh-day Adventist missionaries. A philosophy of SDA missions is to situate a church, school, and hospital all in the same compound. Adu, at the age when most American students are entering their sophomore year of high school, enrolled in the SDA school as a first grader and never looked back. You can hear Professor Worku tell his story here. A few days later the lost mare returned, followed by a beautiful wild stallion. The village congratulated Sei Weng for his good fortune. He said, "That's the way it is." Some time later, Sei Weng's only son, while riding the stallion, fell off and broke his leg. The village people once again expressed their sympathy at Sei Weng's misfortune. Sei Weng again said, "That's the way it is." Soon thereafter, war broke out and all the young men of the village except Sei Weng's lame son were drafted and were killed in battle. The village people were amazed at Sei Weng's good luck. His son was the only young man left alive in the village. But Sei Weng kept his same attitude: despite all the turmoil, gains and losses, he gave the same reply, "That's the way it is." I'll take a moment here to acknowledge a good friend who is trying to adopt Sei Weng's attitude as she deals with breast cancer. Wendy has been exploring in her blog the many positive and life-affirming results of getting the disease. Read about Wendy's story here. I love her henna head. But back to Adu Worku. In my first encounter with him, Adu was not dressed in a suit; rather, he wore the traditional Ethiopian white cotton cloth called shemma (ሸማ), much like the picture below, so I was not sure how "traditional" our second meeting would be, especially since we were about to enter his private space. Adu Worku is a humble man. He playfully calls himself a peasant. Despite our trepidation, we were ready to smile and accept whatever came our way, even if Adu or his wife decided to insert some injera into our mouths. It turns out we had nothing to worry about. As we were nibbling on the abundant Ethiopian food, I asked Adu about the practice of "gursa." After letting me know that it's pronounced gursha (ጉርሻ), not "gursa" (thanks, translation company), Adu explained that it is a very intimate act, usually performed by people who know each other well, like a husband and wife. Adu and his wife demonstrated the practice and then Suzanne and I tried it. It's actually quite similar to the display of intimacy shown by American couples when they shovel cake into each other's mouth at their wedding reception (just without the smearing of frosting on the forehead). In Ethiopia this act of intimacy simply happens more than once in one's adult life. According to my online Amharic dictionary, gursha (ጉርሻ) not only indicates "a mouthful of injera," but it also means a "tip" or "bonus," as in something extra and perhaps unexpected. 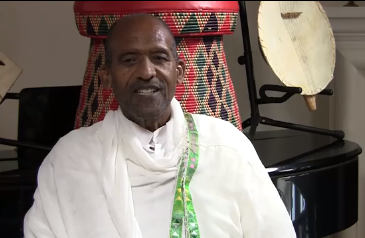 Next Adu played a well-known wedding song on the washint (ዋሽንት), or Ethiopian flute. I actually had learned this song, called Mushiraye (ሙሽራዬ) on piano with Elias Negash. It has something to do with the bride or groom (or both), since "bride" is mushrit (ሙሽሪት) and "groom" is mushra (ሙሽራ). You can hear Suzanne and Adu's wife talking in the kitchen. Suzanne was following rule #7 from Kwintessential's rules of dining etiquette: "A woman should offer to help the hostess with the preparation or clearing up after a meal is served." Then Adu picked up the krar (ክራር), or Ethiopian six-stringed lyre. He tuned the krar to the Ethiopian Batti scale (Lydian variation) and plucked the accompaniment to his song. Here's how the scale looks in C (although it sounds like Adu starts on an F). Next Adu played a song called Fano (ፋኖ) about a person who rebels against the government, retreats to the bush, and becomes a social justice outlaw, not unlike Robin Hood. Adu explains that the krar has traditionally been the instrument of choice for such noble outlaws. Here he strums the lyre instead of plucking it. Adu played several other tunes, all plaintive and heartfelt. He ended by playing the classic song "Tizita" on his other krar that was already tuned to the Ethiopian major pentatonic scale. The song "Tizita" is so well known that Ethiopia's major pentatonic scale is named for it. We soon found out that music runs deep in the family. Adu's son Tad also treated us to a performance, and you will see from this video that Tad is definitely a second-generation Ethiopian American. Here he is singing his song "Smile" and accompanying himself on the guitar. I love that Tad's mom is sitting right next to him as he sings, as if she is the person he wants to make smile. Upon hearing that Tad plays with a band, I asked him if he plans to incorporate the sounds of the masinqo, washint, or krar into his music in the near future. He said he knows he probably will but he wants it to come organically in his journey as a musician. Right now he's busy establishing his credentials as a singer/songwriter. After all the soulful music and conversation, Adu's wife tried to get us to eat more food, which we anticipated. Had we not been expected in Napa, we probably would have stayed longer; it was hard to leave such a special environment. And while no one in the family actually placed food in our mouths in an act of gursha, we certainly left feeling nourished in a deeply intimate way. Visualizing is a very strong tool. If we use it appropriately,it will not only strengthen our imagination and can be helpful in taking us anywhere in the future as well as in the past.